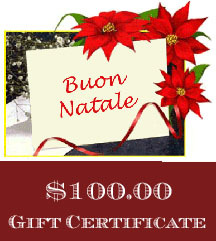 Gift Certificate for $100.00 (USD). You will receive an email with the Gift Certificate Code and instructions for using. The email will also contain a link where you can print out our gift Certificate and write your own personal note. If you would like for us to mail for you, please add in the comments and place the person's name, address in the "ship to".